Hot & cold lunches, soups, salads, healthy selections, seasonal treats, delicious desserts, snacks, drinks, coffee, and more! Let Savoury Chef handle the catering for your next corporate breakfast, office lunch, business meeting, or staff party. We've been serving great food to some of Vancouver's best companies for over 10 years. PS: Stuck? We can help you plan. Get in touch! I’ve been meaning to write to you to thank you and your team for their professionalism and for the wonderful, delicious food. Lots of compliments came my way about it. Thank you for everything! The food was fantastic and I appreciate your great attitude with all of our requests. Take care and hope to work with you again. I have had nothing but rave reviews about the food last night. People are still emailing me this morning about it! We were very impressed last night and will certainly use your company again in the future. Like what you see? Know what you want? *If you’re not quite sure what you need, feel free to get in touch, we can help you plan! , or browse some of our other catering and event planning services. After you place an order, we will promptly reply with an order confirmation and followup for payment confirmation. All orders must be made before 2:59pm for next day deliveries. 48 hours notice is always appreciated, but we will do our best to accommodate your requests. Deliveries for Monday must be placed by 3pm on Friday. There is a $25.00 fee for last minute rush orders. All orders must be cancelled with a minimum of 24 hours (1 business day) notice. Hot items require 48 hours (2 business days) for cancellation. 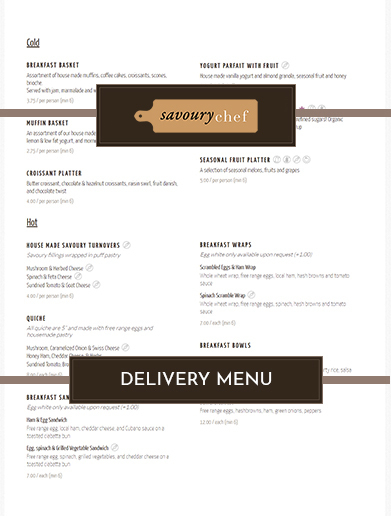 You can now find all of our delivery details on our delivery details page. We accept Visa, MasterCard, Amex, Corporate Cheque, and EFT Payments. All credit card purchase must be called in. We will confirm with you if you require a NET 15 corporate account setup. Savoury Chef Foods can accommodate your guests that have allergies towards certain foods. We strive to ensure that all items sent from our kitchen do not have cross contamination with any noted allergies a guest may have. Although we are not an official ‘Nut Free Kitchen’, we do not carry ‘Peanuts’ in our kitchen at all. We cannot guarantee the absence of cross contamination with other nuts, but do our best to ensure every order is sent out to the specifications and requirements of the allergies presented. 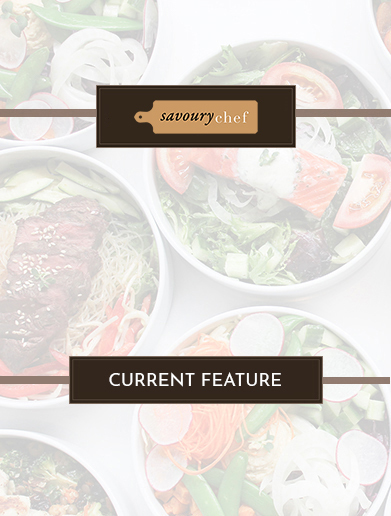 We will not be held liable for any adverse reactions to foods consumed, or items an individual may come in contact with, at any event catered by Savoury Chef Foods and Fresh by SavouryChef. We understand that many offices have unique and incentive food programs in place. We offer a very competitive, weekly office lunch program that we can customize for your office needs. Find out more information below. Contact us to setup a meeting – and one of our fabulous individuals will be in touch!